Do you remember when a huge crossover event took place in one title? Sure, Crisis on Infinite Earths invented the idea of the crossover issue, but you could read Crisis and not have to look elsewhere for explanations. Since then, every mega-event has spread its roots out farther and farther. The entire Marvel rack is stamped with 'Fear Itself' these days. I think it limits purchases and leads to 'event fatigue'. I don't want to have to read an enormous number of books to see what happens to the universe. And if I do, I am simply shifting money away from other titles. Okay, sorry for the rant in what is supposed to be a review of Flashpoint:Lois Lane and the Resistance #2. While DC has done a decent job of keeping Flashpoint out of its monthly titles, it has poured out a lot of mini-series around the main Flashpoint title to help flesh out this new timeline. I don't know if I can read Flashpoint and understand it without having read some of these other books which explain all the major events of this world. As it is, I am only collecting a couple of these minis. So I am probably still going to end up confused. If Traci 13 shows up in the main book and saves the day, I'll be lost. I am not getting Flashpoint:World of Flashpoint. That isn't to say I'm not enjoying some of these separate mini-series. Project Superman and Kid Flash Lost are both working for me. Unfortunately, this Lois book isn't grabbing my attention the way those ones are. I was really hoping that this book would be a true Lois Lane book, a chance to see her shine as a character on a more solo stage. But this is more a team book. 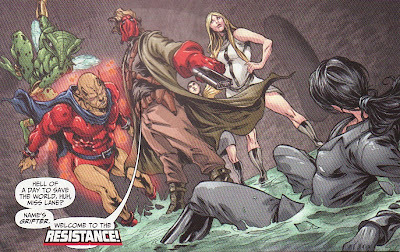 In this issue, the Resistance takes center stage and Lois plays only a small part. In some ways, this seemed to be an issue to promote these other characters (especially Grifter) rather than showcase Lane. It doesn't help that the Flashpoint world is an ugly world with brutal affairs. This is not a pleasant comic. It is hard to know who the heroes are in this book. And there is a rather cavalier approach to death in all these books. Writers Dan Abnett and Andy Landing are able to show us the horrors of the Amazon controlled UK and allow Lois the opportunity to be part of the Resistance movement. But it is hard to know if the Amazons are the 'villains' here. Atlantis seems just as culpable in this war. But this series doesn't touch on Atlantis. We only see the 'evils' of Themiscyra. Eddie Nunez is not on art here. Instead Gianluca Gugliotta is on interiors. The art is engaging enough. But Gugliotta draws eyes in a creepy wide-eyed way which sometimes distracts. Last issue ended with the cliffhanger of Lois escaping the Amazon training camp with the help of British agent Penny Black but facing an Amazonian attack squad. 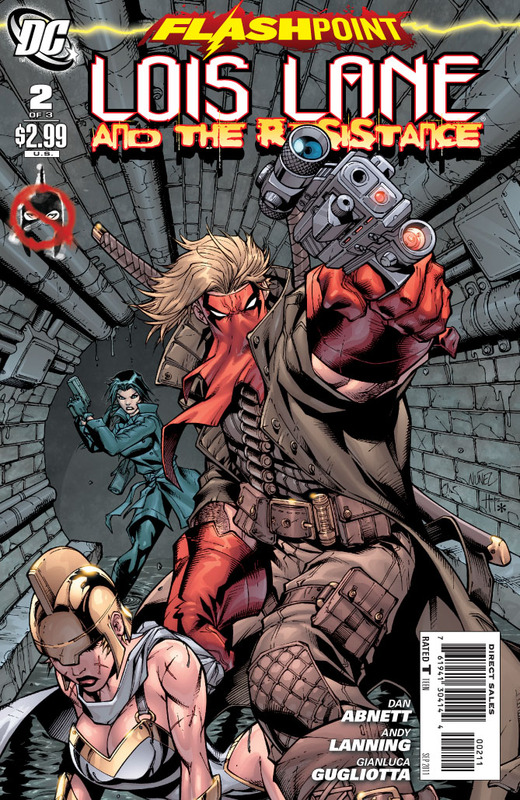 This issue opens with Grifter and his group of Freedom Fighters battling with the same Amazonian group. 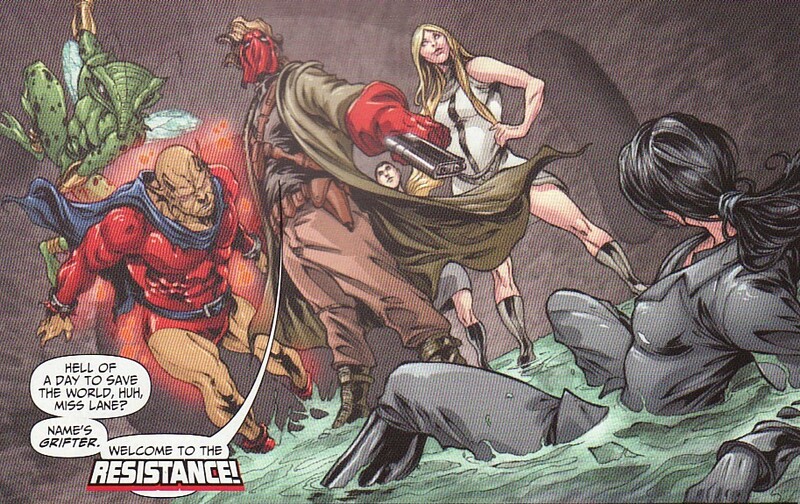 The resistance is a ragtag group of Metans - Godiva, Etrigan, the Canterbury Cricket, Hyde, and Grifter. They are fighting a unit of Furies - Hawkwoman, Cheetah, Vixen, and Huntress. There are several pages of this firefight with the Furies and other Amazonian troops slaughtered. 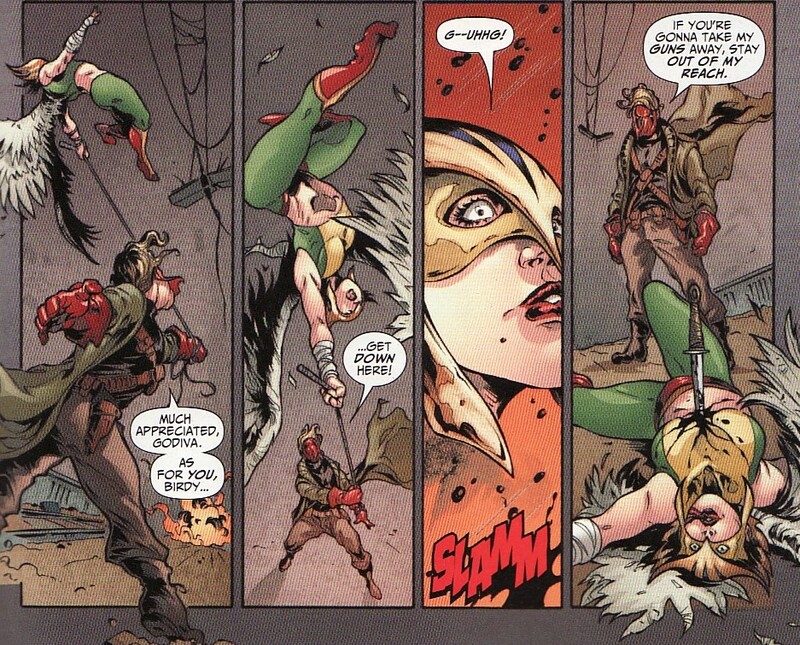 Am I supposed to be cheering when I see Grifter impale Hawkwoman? Because it didn't seem like a nice moment to me. In fact, the only people who die in this book are Amazons, their corpses scattered on the ground. After defeating the Furies, the Resistance take to the sewers and happen to run into Lois. At first the group is wary of Lois but then they welcome her to the resistance. I still don't know about this. Lois was in a re-education camp for almost 3/4 of a year being fed Amazonian ideals day and night. Isn't a bit trusting to take her into your secret lair, even if a taped message from Penny Black says Lois is on the right side of this war? I also didn't like that Lois is suddenly in a black pant suit and trenchcoat. What happened to toga she was in at the end of last issue? Did she really stop to get clothes or change while on the run? With the issue not picking up where last issue left off and with Lois dressed differently, I had a disjointed feeling as a reader. At least we get an explanation of how Lois and Penny escaped the Amazons. Penny threw concussion grenades which caught the Furies by surprise. Penny Black seems cool, a tough spy risking life and limb for country. But I don't quite get while Lois is wandering around away from her? Did they split up? Did Lois decide to explore on her own? Seems odd. Lois does praise Black for saving her life and Grifter agrees. He talks about how she also saved him in Afghanistan. 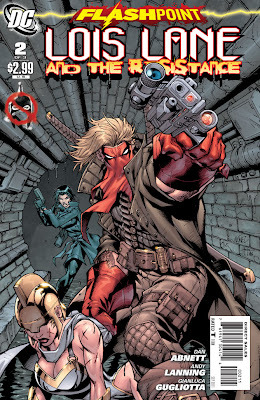 He was part of an elite covert ops squad that included Lady Blackhawk, Kat Kane (in a modified Batwoman outfit), and Jon Stewart (no Green Lantern ring). That would be an interesting book to read more of. I wonder if this means anything about Lady Blackhawk in the DCnU. Is she in it? 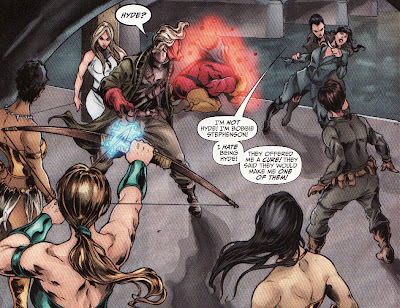 Grifter's team is rescued by Black who is wearing an organic armor and calling herself Britannia. It is a powerful telepathic armor with which she is able to blast away the terrorists. The armor and Grifter's telepathy makes the two have a sudden link. After healing, he goes to London to find her. He happens to be in London when the Atlantis/Themiscyra war hits the UK. He has been hiding since then, helping to fight the Amazonian control as part of a resistance cell. He even rescues Black from a Amazonian prison ship. Somewhere along the way, Black lost the Britannia armor. Despite helping out as a spy, the resistance have been looking for a hidden Britannia v2.0 armor which might turn the tides, freeing the UK. Will Penny Black be part of the DCnU? There are plenty of War books coming out where she might fit in. 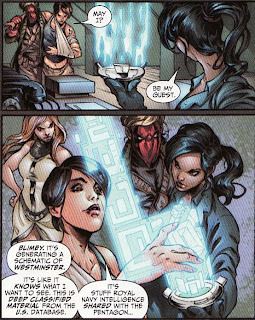 In a bit of deus ex machina, Lois bracelet, the Cyborg communication device is able to link with Penny's built in tech. It is somehow is able find the Britannia armor, hidden in Westminster. Too easy? It felt that way. 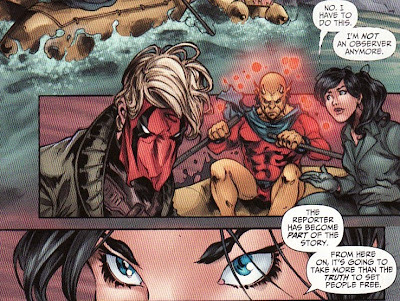 But as I said, Lois is really in the background of this issue. Here is her one big moment. She demands to join the Resistance as they storm Westminster for the armor. I like that she declares that she is part of the story now, not just reporting it. Glad we got some characterization of Lois here. This is supposed to be her book. Unfortunately, it's a trap. Hyde wants to join the Amazons and so tips of the Furies that the Resistance is coming. Lois gets taken at knife point. Another cliffhanger. So I had some problems with the pacing and focus of the first issue. Here I again don't like the focus of the book which seemed written as if Grifter and Penny Black are the stars here. I don't know if I was expecting too much here. Maybe it all comes down to the title. This isn't Lois Lane. This is the Resistance. Maybe I need to reset my expectations. The cover of next issue shows someone wearing the Britannia armor, presumably Black. Does that mean Penny Black will be the hero of this mini? That would seem off to me. I hope we get to see Lois shine in that issue. But I am glad that this Flashpoint world is going away soon. It is a cheerless place. I didn't read this comic because Lois Lane wears slacks in it, this offends my politics since she cannot "celebrate her sexuality" in any way...and I stand foursquare for a fictional woman's right to titillate me. John Feer's personal attack should be deleted as well. Just because he is on one side of the argument, he should not be allowed to say this sort of thing and have those being attacked not allowed to respond. His response was not a personal attack on you and was in response to the countless posts you have put up here voicing the opposite opinion. If I delete his I then have to go back and delete all of yours ... and there are many. You have said your comment and it's content on nearly every post for the last couple weeks. I cannot and will not have you derail this blog. So, as I said before, feel free to comment somewhere else ... or make your own forum. If as many people feel the way you do as you imply, it will be very popular. But I can't have every thread revolve around your agenda. I won't allow it. How can any attack the "anonymous" status? I mean the woods are full of anons and the like?